Honeykomb Cotton Camp Shirt with double lapel pockets, full snap front and short (elbow length) sleeves. Note the cool open-V side notches and the straight hem. Another feature that gives this perky Camp Shirt an "edge" is the distinctive collar that introduces a V-neck. Perfect for travel, this Honeykomb Cotton won't wrinkle and dries fast. Generous Sizing: S, M, L, XL. See details in Size Selections. Note that they are slightly over-sized and most folks order down. Falls to mid-hip (about 26" long). Try our "travel-queen fabric" Honeykomb Cotton for your winter vacation. 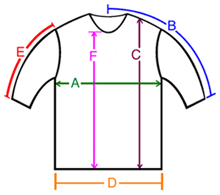 A: Chest / Bust circumference 42-43" 47-48" 51" 52-53"
B: Sleeve length from center of neck to end of sleeve 19.5" 20.5" 21.5" 22"
C: Body length from shoulder to bottom of hem 25.5" 26.5" 27" 28"
D: Hem circumference 44" 48" 52" 54"
E: Sleeve length from shoulder to end of sleeve 10" 10.5" 10.5" 10.5"
F: From the bottom of the V-Neck to hem 19.5" 20" 21" 22"
High quality construction. Very, very comfortable. Had to cut the tag off because it was itchy. Like the mid-hip length. I am a 46" bust and the Med fit nicely. Clean lines. Like the fact that CottonMill sells a lot of 3/4 length sleeves. Really a flattering shirt. The neckline is great. Big honeycomb cotton fan. Would buy again. Pockets add nice interest to the top. Less casual looking. Was pleased with the coral color as it was pinky instead of an orange undertone. Bought this to fit a little bit loosly and really do love it. Rated 4 stars instead of 5 because I had to resew a button after a few weeks.